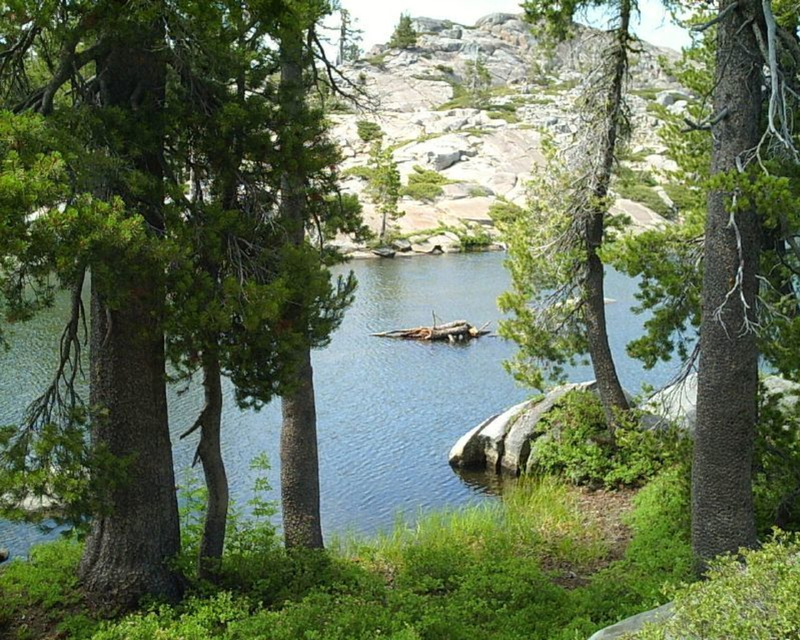 Tired of the same old North Tahoe hikes you’ve experienced time and again? Yearning for something new? Something short but steep and with high alpine lakes at the top perfect for camping, day trips, and swimming? Look no further than the Loch Leven Trail. 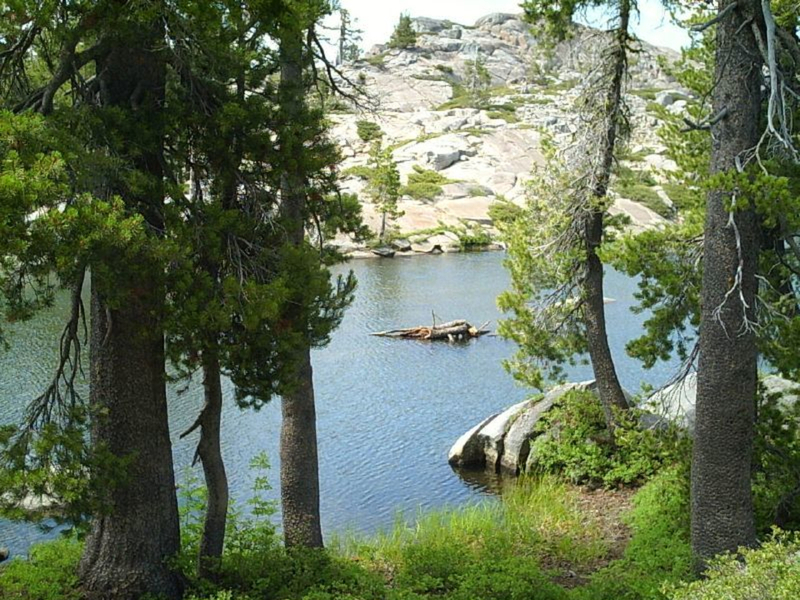 This 3.6 mile trail winds up from the edge of the South Yuba Canyon and Interstate 80 corridor and terminates at a high alpine basin comprised of four lakes: High, Middle, and Lower Loch Leven as well as Salmon Lake. The Loch Leven Trail begins across the road from a parking lot nearby the Big Bend Fire Station on Old Highway 40. The trail trends upward from the road to pass glacial erratics and cross over bare rock. A little over 1-mile up, the trail crosses the Transcontinental Railroad tracks. Note: Hikers with dogs should be aware of this. Nearby, a cold stream bounds down the mountainside. Above the railroad tracks the trail steepens and becomes more exposed. Over 800 feet of elevation are gained between railroad tracks and the Loch Leven basin, which is an additional 1.6 miles away. At the crest of the rim, broken views of the South Yuba River can be seen far below. 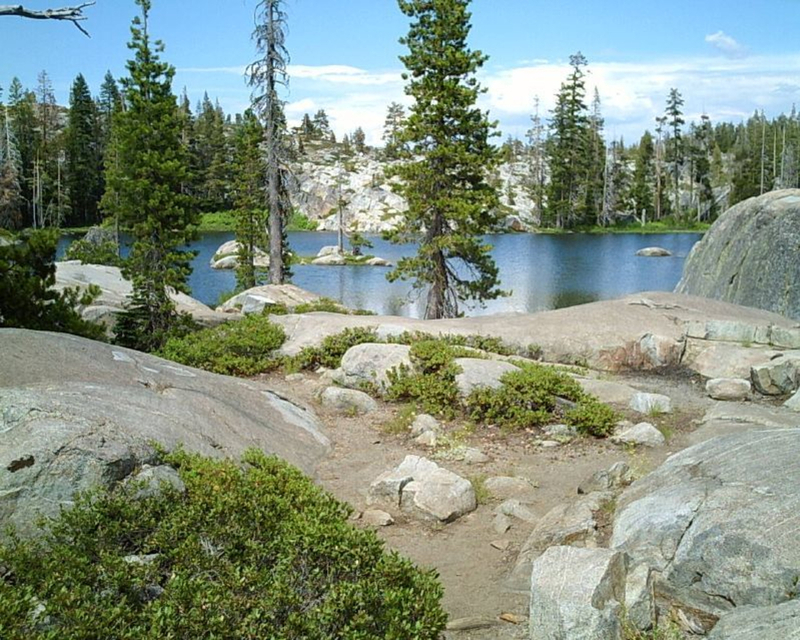 The trail drops slightly into the Loch Leven Lakes basin just a few steps further. At the southern end of Lower Loch Leven the trail splits–the right fork leads to Salmon Lake, and the left leads to Middle and High Loch Leven lakes. High Loch Leven is the end of the 3.6-mile trail. The trail within the basin undulates slightly in elevation between lakes. Reddish rock adorns the shore as do ancient pines. Don’t let the size of the trees fool you; stunted by snow, wind, and limited resources the trees in the Loch Leven basin are far older than they appear. Those looking for a short but steep hike with a reward at the end will love this trail. And don’t let the stuffed parking lot or traffic along the trail soil your reward at the end. The Loch Leven Basin can hide more than a crowd; there’s plenty of sun bathing rocks and tucked away swimming coves for all. Those wishing to cast a few flies or lures on a hike will love the Loch Leven Trail as well. The fishing can be both surprising and rewarding given the size of the lakes. From Truckee, take Donner Pass Road/Old Highway 40 west for 17.8 miles. The parking area will be on your right. Parking is free. Trail begin on the other side of the road.